Presented by Vancouver Foodie Tours and Edible Canada, the tour has been recognized by the Canadian Tourism Commission as a unique Canadian experience. It was one of the first such activities to be inducted into the Canadian Signature Experiences collection in 2011. Edible Canada supports local and Canadian food producers, and the tour reflects this commitment. You may have visited Granville Island Market with limited time and/or an agenda to pick up a specific item, so you’ve bypassed various market stalls because their products weren’t on your list. This tour will give you pause to spend a little more time getting to know the local food that’s available. Whether you decide to go back and purchase what you’ve tasted is up to you but, at the least, you’ll have more options the next time you want to impress visitors with exceptional cuisine that’s farmed or made here, or close by. Meeting at the Edible Canada retail store and restaurant on Johnston Street, we were treated to our first tasting on the tour and given some history of the island and the market. 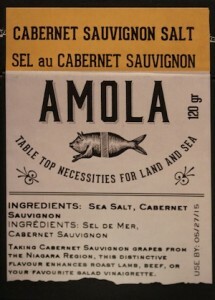 On the menu for the nosh were fish cakes, salad, wine and flavored sea salt. The local ingredients in the meal were Pemberton-grown potatoes. 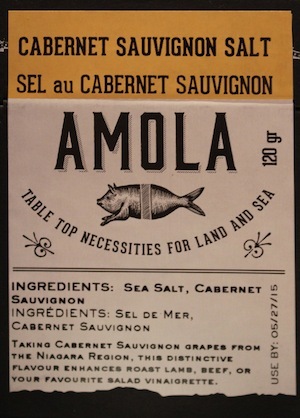 Of particular interest was Amola flavored sea salt, which Edible Canada sells in small packets with flavors such as black truffle and cabernet sauvignon. On the menu for the history was a discussion of the creation of Granville Island and the market. The size of 22 soccer fields, the island was originally dredged out of False Creek in the early 20th century. The reclamation project was to establish an industrial park. Saw mills, steelworks and cement plants went through booms and busts in the area. In the 1970s, the island was redeveloped by the federal government to create the cultural and business destination it is today. The cement factory that still exists on the island is the last heavy-industrial business. In 1972, the administration, management and control of the revitalization of Granville Island were transferred to the Canada Mortgage and Housing Corp. According to CMHC, the island is now home to approximately 275 businesses that generate more than $130 million annually. Granville Island Public Market opened in 1979. They offered Sunday shopping as a way to draw people to the location. The structure that houses the market is the old B.C. Equipment Ltd. building, a wood-framed machine shop. The market has 50 permanent vendors and a rotating roster of approximately 40 farmers and culinary artisans. Next stop was Oyama Sausage, where the charcuterie is infused with Okanagan red wine or sake made around the corner on Railspur Avenue. For cheese aficionados, a six-year-old cheddar from Armstrong and a Swiss-like Rathtrevor from Little Qualicum on Vancouver Island were very well received by our tour group. These were presented by Benton Brothers Fine Cheese. In a far corner of the market, Chilliwack Honey offers a tasting of fireweed honey, named for the flowering plants that grow in areas ravaged by forest fires. The B.C. company has been raising bees in the valley for more than 35 years. In addition to the market tour, other offerings are the World’s Best Food Truck tour and the Guilty Pleasures Gourmet tour. Visit ediblecanada.com.